Person carrying sack waves to snake; pink spider with hands; cloud; sun; and boulder with engravings. On my way home from the shops, just before the entrance to the maze, I met Pinky McHandspider and the Green Snake. In an ordinary neighborhood, one of the houses is shaped like a number 5 and a wine glass. By this house is a man roasting a snake over a hand-shaped fire. 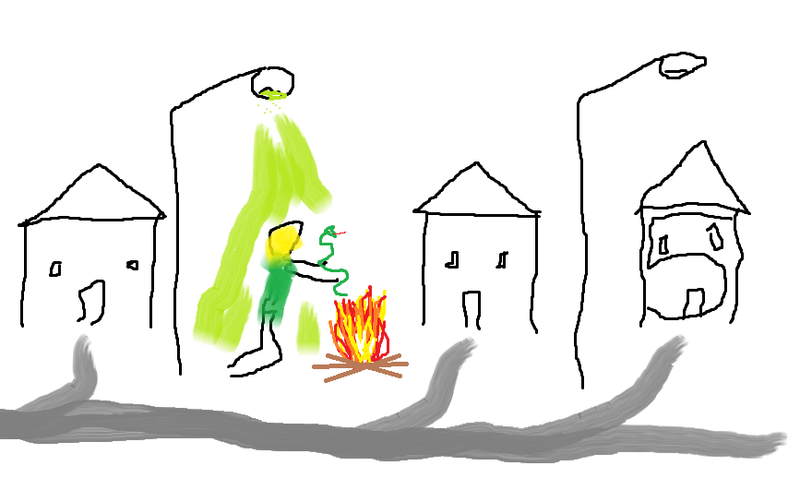 a man in green holds a green snake over a campfire in front of 3 matching houses, one of which is shaped like the number 5. A thin giant with no arms is vomiting over an East Asian man who is holding a snake over a fire; three crooked houses are also vomiting. Three living houses and an armless man breathe on the dark-skinned man who is burning a string. A dark-skinned fellow with a torch in his hand is standing in front of three shabby yellow houses. The houses appear to be on stilts, and a tall, bald fellow with no arms and a red shirt is standing to the right. The armless tall red person meets the short black person who is holding a sparkler. In the background are three houses with legs. A black man shows a lit stick of dynamite to his armless, sunburned friend while standing near a row of townhouses. In front of a row of houses, one man smokes a giant cigar, and another man has a skin condition. No need, actually. I was just about to make a post. Also: I would love to do text. Last edited by The Snide Sniper on Fri Sep 08, 2017 2:35 pm UTC, edited 1 time in total. Standing next to the smoking ashes of something, Cueball smokes a car-sized cigar on the street of a housing development. Two manic identical twins wearing baseball caps with the letter C on stand on a highway. A plain blank-face man stands back and to the right of them; his lack-of-a-face is partially obscured by a enormous smoking irregular-octagonal-shaped piece of brown cardboard. In the background are a yellow house and a red house whose front doors appear to occupy the same vertical plane as the people's torsos and whose roofs are not symmetrical. Two smiling children are standing in the road. Amongst the houses by the side of the road is one shaped like a seven with hair - another person is standing behind this one. Five red houses are standing in a row; the fourth one is shaped like the number 7, has a very muddy roof, and is being kicked by a balding man. In the foreground, a mother and her son are skiing. A couple is going skiing in front of a row of houses. One of the houses has a red roof and is about to crush somebody. A couple in love are sledding down a mountainside with houses and a wizard on it. It's been a while, since I last tried any sort of "artistic" (i.e. not tecnical or doodle) drawing. A guy and a girl are going downhill on a snowy road on a sled. They are in love. Gandalf the Grey is standing in the middle of the road in his 'you shall not pass!' posture. Besides the road are Bavarian houses, one of which has a chimney with no smoke, and there are Alpine mountains in the background. Two people sledding down a mountain slope are about to run into a grey wizard. In the background are two houses, behind which are more mountains. A sledge with two christmas hats on it is sliding down a mountainside towards a swiss army knife on a rock. In the background are two mountains and two brown and green houses.